God has a message for ALL HUMANKIND – The 3 Angels Messages of Revelation 14 are to be studied and the commands therein to be obeyed. Creator God and recognize the hour of judgment. In the fourteenth chapter of Revelation, there are three angels who give a final warning message to the world just before the return of Jesus. Mankind is to make a choice between worshipping God or the beast. 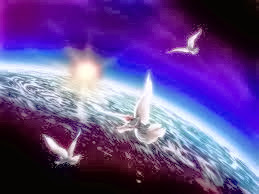 Rev: 6-12, "And I saw another angel fly in the midst of heaven, having the everlasting gospel to preach unto them that dwell on the earth, and to every nation, and kindred, and tongue, and people, saying with a loud voice, Fear God, and give glory to Him; for the hour of His judgment is come: and worship Him that made heaven, and earth, and the sea, and the fountain of waters. And there followed another angel, saying, Babylon is fallen, is fallen, that great city, because she made all nations drink of the wine of the wrath of her fornication. And the third angel followed them, saying with a loud voice, If any man worship the beast and his image, and receive his mark in his forehead, or in his hand, the same shall drink of the wine of the wrath of God, which is poured out without mixture into the cup of his indignation; and he shall be tormented with fire and brimstone in the presence of he holy angels, and in the presence of the Lamb: And the smoke of their torment ascendeth up for ever and ever: and they have no rest day nor night, who worship the beast and his image [the lost], and whosoever receiveth the mark of his name. Here is the patience of the saints [the saved]; here are they that keep the commandments of God, and the faith of Jesus." Let us take a look at the message from the first angel. There are three phases of the judgment mentioned in the Scriptures: the investigative judgment, preceding the second advent; the judgment of the lost world and wicked angels by Christ and the saints during the one thousand years following the second advent; and the executive judgment, or punishment of the wicked at the close of this period. The investigative judgment takes place in heaven before Christ comes, in order to ascertain who are worthy to be raised in the first resurrection, at His coming, and who among the living are to be changed in the twinkling of an eye, at the sound of the last trump. It is necessary for this to take place before the second advent, as there will be no time for such a work between the coming of Christ and the raising of the righteous dead. The executive judgment on the wicked occurs after their cases have been examined by the saints during the thousand years (Rev: 20:3,4; 1 Corinthians 6:1-3). The investigative judgment is that which is announced to the world by the first angel's message. Notice the prophetic view of the judgment that was given to Daniel. "I beheld till the thrones were cast down [placed], and the Ancient of days did sit: . . . thousand thousands ministered unto Him, and ten thousand times ten thousand stood before Him: the judgment was set, and the books were opened." Daniel 7:9,10. In Acts we read of a day in which the world will be judged. "Because He hath appointed a day, in the which He will judge the world in righteousness by that man whom He hath ordained; whereof He hath given assurance unto all men, in that He hath raised Him from the dead." Acts 17:31. In this first angel's message we see how extensively this message will be proclaimed, "To every nation, and kindred and tongue and people." The world is called upon to, "Fear God, and give glory to Him." This is done because of a coming event, "For the hour of His judgment is come." We are then told whom we are to worship, "Him that made heaven, and earth." There is only one gospel (Romans 1:16,17; Galatians 1:8), first announced in Eden (Genesis 3:15), preached to Abraham (Galatians 3:8) and to the children of Israel (Hebrews 4:1,2), and proclaimed anew in every generation. In its development the gospel meets the needs of every crisis in the world's history. John the Baptist in his preaching announced the kingdom of heaven at hand (Matthew 3:1,2), and prepared the way for the first advent (John 1:22,23). Christ Himself, in His preaching of the gospel, announced the fulfillment of a definite-time prophecy (the sixty-nine weeks, or 483 years, of Daniel 9:25), and called the people to repentance, in view of the coming of the predicted Messiah (Mark 1:14,15). So when the time of the judgment comes, and Christ's second advent is near, a world-wide announcement of these events is to be made in the preaching of the everlasting gospel adapted to meet the need of the hour. There is a prophetic period which extends to the time of the cleansing of the sanctuary, or the investigative judgment. "And he said unto me, Unto two thousand and three hundred days; then shall the sanctuary be cleansed" Daniel 8:14. This 2,300 days or actually prophetic years, ended in 1844. The 70 weeks or 490 years prophecy, and the 2300 days or years prophecy, both began in 457 BC with Artexerxes decree to rebuild Jerusalem. Our Lord based His preaching of the gospel on the fulfillment of the first part of the 2,300 days, or years (Mark 1:14,15), a prophecy which determined the time of the first advent. The whole period extends to the time of the judgment, just preceding the second advent, and at its expiration a special gospel message is sent to all the world, proclaiming the judgment hour at hand and calling upon all to worship the Creator. The facts of history answer to this interpretation of the prophecy, for at this very time, 1844, just such a message was being proclaimed in various parts of the world. This was the beginning of the great second advent message which is now being proclaimed throughout the world. In this first angel's message, we are called upon to worship our Creator who also formed this earth. There are other Bible texts which call for us to do the same, Jeremiah 10:11,12; Psalms 95:3-6, Revelation 4:10-11, and most importantly Exodus 20:8-11 "Remember the Sabbath day, to keep it holy. . . For in six days the Lord made heaven and earth, the sea, and all that in them is, and rested the seventh day; wherefore the Lord blessed the Sabbath day, and hallowed it." In this message of judgment, we are called upon to worship the Creator, who also created the Sabbath day. Note how the Sabbath has a part in salvation, "Moreover also I gave them My Sabbaths, to be a sign between Me and the, that they might know that I am the Lord that sanctify them" Ezekiel 20:12. Here we are told who will be judged, "For we must all appear before the judgment seat of Christ; that every one may receive the things done in his body, according to that he hath done, whether it be good or bad." 2 Corinthians 5:10. The standard by which we will be judged is also given, "For whosoever shall keep the whole law, and yet offend in one point, he is guilty of all. For He that said, Do not commit adultery, said also, Do not kill. Now if thou commit no adultery, yet if thou kill, thou art become a transgressor of the law. So speak ye, and so do, as they that shall be judged by the law of liberty." James 2:1-12. We are told what the whole duty of man is, "Let us hear the conclusion of the whole matter; Fear God, and keep His commandments; for this is the whole duty of man. For God shall bring every work into judgment, with every secret thing, whether it be good, or whether it be evil." Ecclesiastes 12:13,14. Friend, we will all be judged according to the light of truth that we have come in contact with, in relation to our obeying the Ten Commandments. By Jesus coming into our heart and living through us, we are capable of obeying Him. "And there followed another angel, saying, Babylon is fallen, is fallen, that great city, because she made all nations drink of the wine of the wrath of her fornication." Revelation 14:8. In the old testament we are given a prophetic warning regarding the fall of ancient Babylon, "Flee out of the midst of Babylon, and deliver every man his soul; be not cut off in her iniquity; for this is the time of the Lord's vengeance; He will render unto her recompence." Jeremiah 51:6. At the time of the fall of the Babylonian Empire to the Medes and Persians, we are told how Belshazzar and his court defied the true God, "They brought the golden vessels that were taken out of the temple of the house of god which was at Jerusalem; and the king, and his princes, his wives, and his concubines, drank in them. They drank wine, and praised the gods of gold, and of silver, of brass, of iron, of wood, and of stone." Daniel 5:3,4. The gospel of the kingdom was preached in Babylon through Daniel, and Nebuchadnezzar was brought to acknowledge and to worship by his experience. But after Nebuchadnezzar's death his successors failed to profit by his experience. The climax was reached when Belshazzar used the sacred vessels from the house of God, dedicated to His worship, in which to drink the Babylonian wine of idolatrous worship. Then came the handwriting on the wall, the fall of ancient Babylon, and the death of Belshazzar. See the Steps to Life Bible studies. Notice how Babylon had caused the whole earth to become, "Babylon hath been a golden cup in the Lord's hand, that made all the earth drunken; the nations have drunken of her wine; therefore the nations are mad." Jeremiah 51:7. Through the centuries the astrological beliefs of the Chaldeans of Babylon eventually "penetrated as far as India, China, and Indo-China, where divination by means of the stars is still practised. . . In the opposite direction they spread to Syria, to Egypt, and over the whole Roman world." Franz Cumont, Astrology and Religion Among the Greeks and Romans. In the visions of John there were interpretations given of the impure woman with a golden cup in her hand, seated on a seven-headed beast, "And the woman which thou sawest is that great city, which reigneth over the kings of the earth." Rev: 17:18 (See verses 3, 4, 9.) The great city which reigned over the kings of the earth in John's time was Rome; and that seven-hilled city has given its name to the power which succeeded to its dominion--the organization which is represented by the woman, the Church of Rome, ruled by the Papacy. In this same prophecy, this religio-political power, the Roman Church, or the Papacy, is designated as the counterpart of ancient Babylon. "And upon her forehead was a name written, MYSTERY BABYLON THE GREAT." Verse 5. The parallels between the Roman Church and ancient Babylon are striking, as we view the pagan Babylonian state religion with its wealthy and politically powerful hierarchy, its elaborate temple ritual, its priestly monopoly of learning, its liturgy performed in an ancient language unknown to the common people, its processions of divine images, its great spring festival in which mourning is followed by rejoicing, its ubiquitous virgin mother goddess who intercedes for her worshipers. But there is even more than a parallel; there is a genuine line of inheritance, from Babylon through the Roman Empire to the Roman Church, of many religious elements. Ancient Babylonian religion had immoral features, but modern Babylon commits spiritual fornication, polluting the church with false doctrines and pagan practices, and having illicit connection with the secular powers to enforce her teachings; and like her ancient namesake, Roman Babylon has made many nations drink impure wine from her cup. Notice the cup Jesus offers in the Lord's supper. "This cup is the new covenant in My blood." Luke 22:20, R.V. The new covenant is described with an essential teaching, "For this is the covenant that I will make with the house of Israel after those days, saith the Lord; I will put My laws into their mind, and write them in their hearts; and I will be to them a God, and they shall be to Me a people." Hebrews 8:10. The heart makes a true transformation when Christ ministers the law within, "For the law of the Spirit of life in Christ Jesus hath made me free from the law of sin and death. For what the law could not do, in that it was weak through the flesh, God sending His own son in the likeness of sinful flesh, and for sin, condemned sin in the flesh; that the righteousness of the law might be fulfilled in us, who walk not after the flesh, but after the Spirit." Romans 8:2-4. Mankind has substituted a different teaching in an attempt to made void the law of God. "Howbeit in vain do they worship Me, teaching for doctrines the commandments of men. . . . And He said unto them, Full well ye reject the commandment of God, that ye may keep your own tradition." Mark 7:7-9. The Roman Church says of the Bible and tradition, "Though these two divine streams are in themselves, on account of their divine origin, of equal sacredness, and are both full of revealed truths, still, of the two, TRADITION is to us more clear and safe." (emphasis supplied) Catholic Belief, p. 45, 1884. Notice how Babylon's daughters reveal their mother's characteristics, "And upon her forehead was a name written, MYSTERY, BABYLON THE GREAT, THE MOTHER OF HARLOTS AND ABOMINATIONS OF THE EARTH." Rev: 17:5. The authoritative Creed of Pope Pius IV says in Article 10: "I acknowledge the Holy Catholic Apostolic Church for the mother and mistress of all churches." When professed Protestant churches repudiate the fundamental principle of Protestantism by accepting human speculation, tradition, or political power, in place of the authority and power of God's word, they may be regarded as daughters of Babylon. Their fall is then included in hers, and calls for a proclamation of the fall of modern Babylon. The extent of the apostasy, or fall, of modern Babylon, the mother, and of her daughters, will reach a certain low point. "And after these things I saw another angel come down from heaven, having great power; and the earth was lightened with his glory. And he cried mightily with a strong voice, saying, Babylon the great is fallen, is fallen, and is become the habitation of devils, and the hold of every foul spirit, and a cage of every unclean and hateful bird. For all nations have drunk of the wine of the wrath of her fornication, and the kings of the earth have committed fornication with her, and the merchants of the earth are waxed rich through the abundance of her delicacies." Rev: 18:1-3. Modern Babylon will meet its end through vengeance from a Holy God. "And a mighty angel took up a stone like a great millstone, and cast it into the sea, saying, Thus with violence shall that great city Babylon be thrown down, and shall be found no more at all. . . . And in her was found the blood of prophets, and of saints, and of al that were slain upon the earth." verses 21-24. There will be a certain final call to come out of Babylon that will sound forth. "And I heard another voice from heaven, saying, Come out of her, My people, that ye be not partakers of her sins, and that ye receive not of her plagues. For her sins have reached unto heaven, and God hath remembered her iniquities." verses 4,5. Those who come out of Babylon will sing a certain song of triumph, "Alleluia; for the Lord God omnipotent reigneth. Let us be glad and rejoice, and give honour to Him." Rev: 19:6, 7. How are those described who heed this warning? "Here is the patience of the saints; here are they that keep the commandments of God, and the faith of Jesus." Rev:14:12.
WHO IS THE BEAST POWER? What description is given of the beast against whose worship this closing warning message is given? "And I stood upon the sand of the sea, and saw a beast rise up out of the sea, having seven heads and ten horns, and upon his horns ten crowns, and upon his heads the name of blasphemy. And the beast which I saw was like unto a leopard, and his feet were as the feet of a bear, and his mouth as the mouth of a lion; and the dragon gave him his power, and his seat, and great authority." Rev: 13:1,2. In this composite beast from the sea are combined the symbols of the seventh chapter of Daniel, representing Rome, Greece, Medo-Persia, and Babylon. Its blasphemous words, its persecution of the saints, and its allotted time (verses 5-7) show that his beast, under one of its seven-headed manifestations, is identical with the little horn of the vision of Daniel 7, modern Babylon, the Papacy. The worship of the beast is the rendering of that homage to the Papacy which is due to God alone. The system of religion enforced by the Papacy contains the paganism of Babylon, Medo-Persia, Greece, and Rome, indicated by the beast's composite character (verse 2), disguised under the forms and names of Christianity. The Roman Ponitfex Maximus was continued in the pope, who is the head of the Roman priesthood. In pomp and pride he claims to be the representative of the meek and lowly Jesus. But this scripture in Revelation shows that the pope's power and his seat and his great authority do not come from Christ. What challenge is made by those who worship the beast? "And they worshipped the dragon which gave power unto the beast; and they worshipped the beast, saying, Who is like unto the beast? Who is able to make war with him?" Rev: 13:4. What did Babylon give the nations to drink? "She made all nations drink of the wine of the wrath of her fornication." Rev: 14:8, last part. What are those to drink who accept the teachings of Babylon, and thus render homage to the beast? "The same shall drink of the wine of the wrath of God, which is poured out without mixture into the cup of His indignation." Rev: 14:10 first part. The cup of the Lord, which contains the new covenant in the blood of Christ, and the cup of the wine of the wrath of Babylon are both offered to the world. To drink of the former, that is, to accept the true gospel, is to receive everlasting life; but to drink of the wine of Babylon, that is, to accept the false gospel taught by the Papacy, will result in drinking of the wine of the wrath of God from the cup of His indignation. The true gospel means everlasting life; the false gospel, everlasting death. Under what threatened penalty is the worship of the image of the beast enforced? "And he had power to give life unto the image of the beast, that the image of the beast should both speak, and cause [decree] that as many as would not worship the image of the beast should be killed." Rev: 13:15. What universal boycott is to be employed, in an attempt to compel all to receive the mark of the beast? "And he causeth all, both small and great, rich and poor, free and bond, to receive a mark in their right hand, or in their foreheads; and that no man might buy or sell, save he that had the mark, or the name of the beast, or the number of his name." ." Rev: 13:16, 17.
Who is the real power operating through the beast? "The dragon gave him his power, and his seat, and great authority." Rev: 13:2.
Who is the dragon? "And the great dragon was cast out, that old serpent, called the Devil, and Satan, which deceiveth the whole world." Rev: 12:9. How did the devil seek to induce Jesus to worship him? "And the devil, taking Him up into an high mountain, shewed unto Him all the kingdoms of the world in a moment of time. And the devil said unto Him, All this power will I give Thee, and the glory of them; for that is delivered unto me; and to whomsoever I will I give it. If Thou therefore wilt worship me, all shall be Thine." Luke 4:5-7. How did Jesus show His loyalty to God? "And Jesus answered and said unto him, Get thee behind Me, Satan; for it is written, Thou shalt worship the Lord thy God, and Him only that thou serve." Verse 8. The threefold message of Revelation 14:6-12 is proclaimed in connection with the closing scenes of the great controversy between Christ and Satan. Lucifer has sought to put himself in the place of God (Isaiah 14:12-14), and to secure to himself the worship which is due God alone. The final test comes over the commandments of God. Those who acknowledge the supremacy of the beast by yielding obedience to the law of God as changed and enforced by the Papacy, when the real issue has been clearly defined, will, in so doing, worship the beast and his image, and receive his mark. Such will take the side of Satan in his rebellion against God's authority. How many will yield to the demand to worship the beast? "And all that dwell upon the earth shall worship him, whose names are not written in the book of life of the Lamb slain from the foundation of the world." Rev: 13:8. In the judgment-hour message, whom are all called upon to fear, glorify, and worship? "Fear God, and give glory to Him; for the hour of His judgment is come; and worship Him that made heaven, and earth, and the sea, and the fountains of waters." Rev: 14:7.
Who will sing the victor's song on the sea of glass? "And I saw as it were a sea of glass mingled with fire; and them that had gotten the victory over the beast, and over his image, and over his mark, and over the number of his name, stand on the sea of glass, having the harps of God. And they sing the song of Moses the servant of God, and the song of the Lamb, saying, Great and marvelous are Thy works, Lord god Almighty; just and true are They ways, Thou King of saints. Who shall not fear Thee, O Lord, and glorify Thy name? for Thou only art holy; for all nations shall come and worship before Thee; for They judgments are made manifest." Rev:15:2-4. Reference: Bible Readings For The Home, pp. 245-259. It is now up to us to choose. A loving God has given us free choice. Choose wisely, for we are not able to choose the consequences of our free choices.